as seen from near the “level crossing gate” at SU 519972. 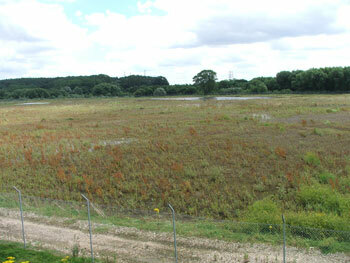 This marks the northernmost limit of the flood and is similar to that of January 2003.
as seen from the top of the mound. 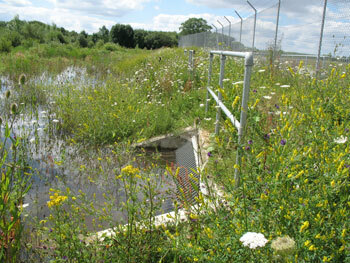 According to RWE npower, there are 6 million gallons of water in here somewhere! This is more or less the same view as above, but taken 3 days earlier. 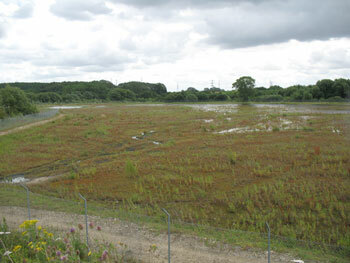 On the mound looking across “H/I” towards Orchard Lake (M) on 23 July 2007.
looking across to Orchard Lake (M) with its flooded trees. This view corresponds to the centere of the picture above. 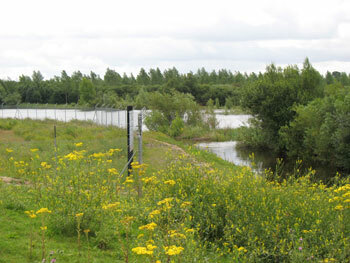 This photograph was taken on 24/7/07 at 14:19 looking along the eastern edge of “Lake H/I” from the SE corner.The whole area was flooded, including the footpath by the pumping station and the northern footpath of H/I between Radley Brook. It was about 30cm deep. on the 24/7/07 at 14:20 looking towards the southernmost bridge under the railway. 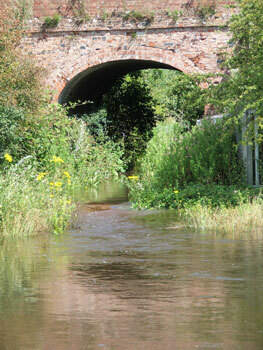 The water is flowing quite fast towards the camera. which are supposed to allow water to enter into the lake at such times. 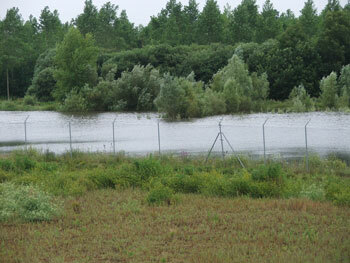 The pictures show floodwaters enveloping Lake H/I on 3 sides, but little water inside the lake. 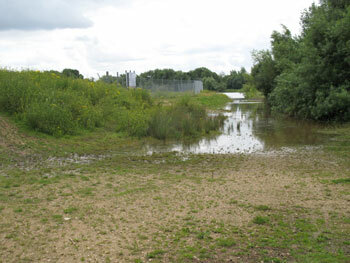 Some water did enter the flood gates, but not enough to cover the whole lake surface because the the level of the ash at the western end (at “Lake I”) was above the flood level. 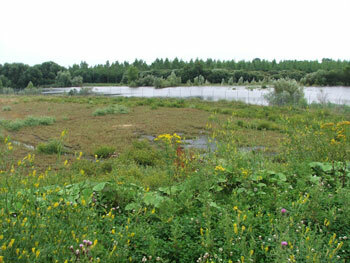 From observations of the depth of the water before and after, it is estimated that about alf as much water as claimed entered the lake. 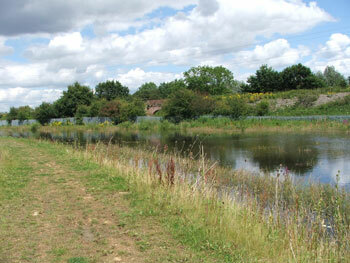 This lake occupies about 17 hectares of floodplain just to the north of Abingdon.